Shepard’s script focuses almost exclusively on the tense and turbulent relationship between Austin (Ja’min Williams) and his older brother Lee (Aaron Allen). Some of America’s most gifted male actors have sought after and tackled the roles of Austin and Lee, from originators Peter Coyote and Jim Haynie, to Gary Sinise and John Malkovich (both relatively unknown actors in 1982), to Philip Seymour Hoffman and John C. Reilly, who famously switched roles sometimes during a Broadway run of “True West” in 2000. Austin is a successful screenwriter with a wife and children, who is housesitting for “Mom” and working on a new script as the play opens. Enter Lee, his ne’er do well brother, a common thief and a drifter, who has just spent three months living in the desert. The estranged brothers have not seen each other for five years. As the drama progresses, and almost inexplicable circumstances involving film producer Saul intervene, a role reversal of sorts develops. Austin, initially the stable brother trying his best to deflect the brutish, bullying tactics of Lee, spirals into near madness (and constant inebriation) in Act 2 and gives his brother a run for his money in the browbeating department. The initially menacing Lee, once he sees an opportunity to go legitimate as a screenwriter in his own right, becomes the frustrated victim of his younger brother’s taunting. Shepard transforms them so completely that even their oppositional parental identifications seem to switch (Austin clearly identifies with “Mom” initially, but later snatches away from Lee his identification with their absent, alcoholic father). The sibling rivalry, always in full display, turns destructive and scary by the end of the production. Allen portrays Lee’s occasional obliviousness well, as when he delivers the line, “It’s not a film, it’s a movie. Big difference!” with the conviction only a dolt would dare. 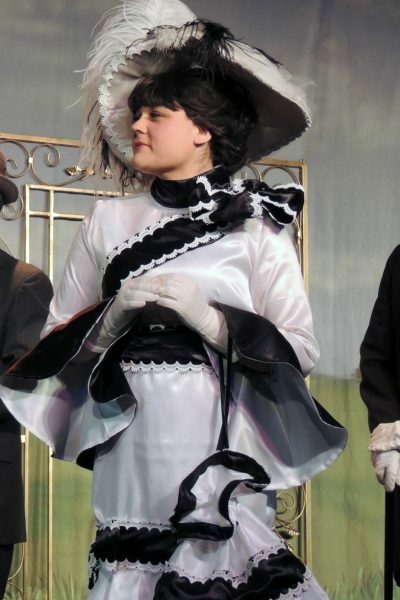 But it’s Williams’ polar opposite transformation in Act 2 which steals the show. The drunk, giddy mess of a man-boy obsessed with toasters (don’t ask; you have to see the show) is almost unrecognizable from the calm, steady Austin of Act 1. Williams pulls this off to great effect with occasional sing-song line delivery and an animalism the audience never saw coming. Supporting players Charles Lidard (as Saul) and Shirvita Upchurch (as Mom) are not on stage that often, but both brought a unique energy to the proceedings. Lidard’s portrayal of Saul bordered on the sleazy, but never went over the top, as he inexplicably switches allegiances between Austin and Lee. Upchurch appears only at the tail end of the production, but the audience could feel her growing exasperation with her “boys” as she returns home from an Alaska vacation only to find her home nearly destroyed and later witnessing her sons in seemingly mortal combat. Set and Lighting Designer G. Maurice “Moe” Conn’s single set evokes the same nostalgia, from the Formica cabinets in the kitchen to the terra cotta walls in the brothers’ mother’s desert rancher forty miles east of Los Angeles. Conn’s attention to every detail on the set is worthy of high praise. For example, when Austin opens the fridge for a beer, the audience sees a fully stocked appliance which looks as crowded and messy as their own might seem. His creative lighting touches are evocative in a different way, most especially at the production’s finale when a near blackout is framed by new, blood red lighting from above as a harbinger of an even worse confrontation to begin between the brothers than those the audience has already witnessed throughout the play. Costume Designer James J. Fasching dresses fickle movie producer Saul Kimmer in the requisite chains, loud shirt, and white suit we wouldn’t blink an eye at in 1979, and he appropriately adorns the brothers’ mother (referred to in the script simply as “Mom”) in a period white pants suit. The brothers’ attire changes during the course of the play in a way which aptly mirrors their respective transformations as a curious role reversal takes place. Stage Manager Amanda Halcott’s scene transitions must have been challenging to design and appeared equally challenging to execute, especially in Act 2 when Mom’s house undergoes a change from relatively pristine to completely trashed, but Halcott’s crew managed them with only minimal delays. Running Time: 1 hour 50 minutes including a 10 minute intermission. 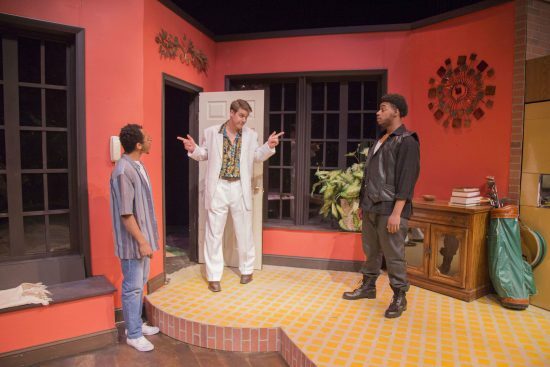 “True West” plays through April 1, 2019, Performing Arts at CCBC, at the Center for the Arts Theatre at CCBC Catonsville, MD. For tickets call (443) 840-ARTS (2787) or click here.